Authorities work to extinguish a stubborn junkyard fire in the Kensington neighborhood of Philadelphia, Wednesday, July 11, 2018. The fire was reported around 8:30 p.m. Tuesday and spewed thick smoke and flames that could be seen for miles. Authorities say the burning materials consisted mainly of metal, wood, and paper. Two months have passed since firefighters extinguished a massive junkyard fire in Kensington, but the battle between its operators and the city rages on. On Thursday, lawyers for both sides are scheduled to clash again before a municipal court judge, with city solicitors seeking a $2.7 million fine for code infractions that they say stretch back years and may have contributed to the July 10 fire. The attorney for David Feinberg, the owner of Philadelphia Metal & Resource Recovery, says it's an unusually large and unfair sanction — and a veiled attempt to oust the junkyard and further gentrify another neighborhood. "They want to redevelop that area, and take out industrial use, and put in residential use," said the lawyer, Darlene Threatt. "And nobody wants to live near a scrap yard." City officials declined to comment on her claims, but one community advocate called them "laughable." "From our perspective, we think the city is doing an admirable job in taking a stand in this effort for health safety and welfare in all of our neighborhoods regardless of income, race or walk of life of the residents who live there," said Andrew Goodman, of the New Kensington Community Development Corporation. The blaze in the 2200 block of East Somerset Street burned out of control for nearly three hours, spewing dense black smoke across the sky. It helped spark a review of the dozens of junkyards across Philadelphia, too many for the city to effectively regulate. 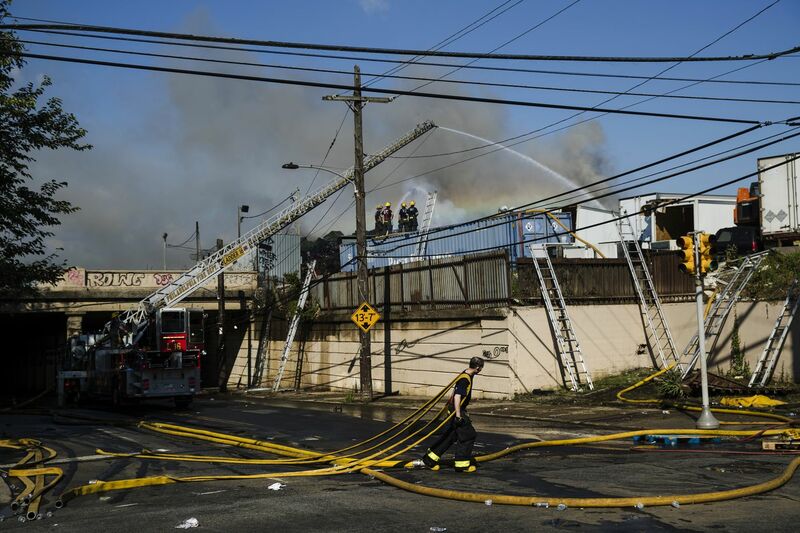 For three hours on July 10, firefighters battled a four-alarm junkyard fire at Tulip and Somerset Streets in Kensington. Citing a raft of violations, Licenses & Inspections officials ordered Feinberg's site closed, but he was able to reopen it weeks later. While the junkyard has cleared 100 percent of the nuisance violations cited by Licenses & Inspections, the city is seeking compensation for code infractions that date back to 2014. Feinberg contends he didn't own the property until 2016, so he doesn't feel responsible for the missives of a previous owner. Members of the city's Scrap Yard Task Force visited the yard in April 2017, and did not find any particularly egregious violations. According to city guidelines, statutory fines can be requested by the city for a minimum of $150 and a maximum of $300 for each day per past-due fine. In most cases, the owner receives a violation from the city, clears the violation, and does not have to go to court. If the city does file a case against the owner, generally, the goal is to clear the violations before the case goes to court. Depending on whether the owner cured the violations and the seriousness of them, the judge will calculate a fine. At a hearing Aug. 30, city attorney William Fernandez said Licenses & Inspections justified the fine request by noting the city cited the facility multiple times for fire code infractions in the last 10 years. He called Feinberg a "neglectful" property owner. "And something did happen as a result," he said that day. "There was a massive, four-alarm fire at the premises that required, unfortunately, a large response from the fire department." The hearing Thursday is scheduled for 10 a.m. before Common Pleas Court Judge Paula A. Patrick.